Billy the Kid’s Gang, aka: The Rustlers (1876-1880) – There were a number of men who threw in with Billy the Kid in his New Mexico exploits during the 1870’s. Billy, deeply involved in the Lincoln County War, a territorial dispute in New Mexico, was already a veteran thief, cattle rustler and shootist. However, his outlaw reputation grew during the “war” on the side of the ” Regulators ” and he soon gathered up a group of other outlaws who helped to perpetuate his criminal pursuits. The core members of the gang, sometimes referred to as the “Rustlers,” were Tom O’Folliard, Charlie Bowdre, Tom Pickett, Billy the Kid, “Dirty Dave” Rudabaugh, and Billy Wilson. Of these outlaws, who primarily rustled cattle and horses, as well as passing counterfeit bills and becoming experts at escaping from jail, several of them were killed by Sheriff Pat Garrett, but others continued their lives beyond their criminal careers. 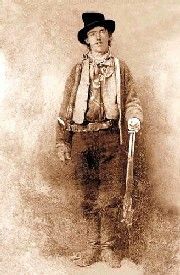 Tom “Big Foot” O’Folliard, Billy’s second-in-command and a former Regulator was the first to be killed when Sheriff Pat Garrett shot him at Fort Sumner, New Mexico on December 19, 1880. Just five days later, Charlie Bowdre, another former Regulator, was killed by Pat Garrett’s posse at Stinking Springs, New Mexico on December 23, 1880. In the end, Garrett tracked down Billy the Kid and killed him on July 14, 1881. History varies on the death of “Dirty Dave” Rudabaugh, a former Dodge City Gang member, who most say was decapitated by citizens at Parral, Mexico on February 18, 1886. Other reports say he died of old age in Oregon in 1928. Billy Wilson, who moved on to Texas after the others were killed was, himself shot by a man named Ed Valentine at Sanderson, Texas on June 14, 1918. However, others say that he actually died of natural cause at New Madrid, Missouri on September 30, 1935. Tom Pickett, another former Dodge City Gang member, died of old age at Winslow, Arizona on May 14, 1934.